This is a list of the names of Filipino mixed martial arts (MMA) fighters who had fought or currently fights for the UFC (Ultimate Fighting Championship). In the list below, they are arranged alphabetically with the first letter of their surnames as the basis. Following the names of the fighters are bits of information about their careers and their stints in the UFC. Do take note that this Filipino UFC fighters list includes both active UFC fighters and those who left the organization or were released by it. Rolando Dy - After stints in several organizations like Nemesis MMA, Pacific Xtreme Combat, Legend FC, and Brave Combat Federation, Dy made his debut in the UFC on June 17, 2017 in Singapore. He faced Alex Caceres and lost by technical knockout in the third round due to an eye injury. Carls John De Tomas - Like his compatriot Rolando Dy, De Tomas made his debut in the UFC on June 17, 2017 in Singapore. He lost to Naoki Inoue of Japan via unanimous decision. Prior to joining the UFC, De Tomas campaigned in the Universal Reality Combat Championship (URCC) where he accumulated six straight wins. He fought Alex Perez for his second UFC fight on December 9, 2017 but lost via submission in the second round. Jenel Lausa - A native of Iloilo, Lausa made his debut in the URCC in 2011. He then fought for about four years in the PXC organization. He was signed by the UFC in 2016 and made his debut in the organization in the undercard of Rober Whittaker versus Derek Brunson in Melbourne, Australia. He won his fight against Zhikui Yao via unanimous decision. Chris Cariaso - Born and raised in San Jose, California, Cariaso had an MMA record of 10 wins and 2 losses when he debuted in the UFC in January of 2011. His UFC record currently stands at 7 wins and 4 losses. He has fought some of the best in the flyweight division like Demetrious Johnson, John Moraga and Michael McDonald. He is scheduled to engage Henry Cejudo on March 14, 2015. Shane Del Rosario - From Newport Beach, California, Del Rosario fought only twice in the UFC. He lost both fights to Stipe Miocic and then Pat Barry. He hasn't fought since December 2012. Before joining the UFC, Del Rosario was undefeated in 11 fights in other MMA organizations. All of these were via knockouts and submissions. John Dodson - From Albuquerque, New Mexico, Dodson is considered as one of the best flyweights in the world. He had wins over big name fighters like John Moraga and T.J. Dillashaw. His UFC record currently stands at 5 wins and only 1 loss. Mark Eddiva - Born and raised in the Philippines, Eddiva was a decorated wushu athlete before he turned his attention to mixed martial arts. He racked up five wins in different organizations before he was signed by the UFC in 2014. He fought twice that year, winning his debut in Macau then losing his second fight which was held in Brazil. Dave Galera - A team mate of Mark Eddiva, Galera was the first homegrown Filipino fighter to enter the octagon. He was undefeated in five fights when he debuted for the UFC in an event held in Singapore in January 2014. He lost the fight via unanimous decision. Galera hasn't fought since the loss. Robbie Lawler - From San Diego, California, Lawler had two stints in the UFC. He fought for the organization in the early 2000's. After losing two fights in a row in 2004, Lawler set his sight on other organizations. He fought in Superbrawl, KOTC, Pride, IFL, EliteXC, and Strikeforce. He returned to the UFC in 2013 and fought his way to the top. He is now the current UFC welterweight champion. Mark Munoz - Fighting out of California, Munoz first fought in the UFC in 2009. He has fought some of the biggest names in the middleweight division like Yushin Okami, Demian Maia, Chris Leben, Chris Weidman, Tim Boetsch and Lyoto Machida. Roldan Sangcha-an - After winning his first four fights either via knockout or submission, Sangcha-an was signed by the UFC in 2014. He made his debut in June of the same year and lost to Richie Vaculik. Sangcha-an is also from Team Lakay and he hails from Mt. Province in the Philippines. 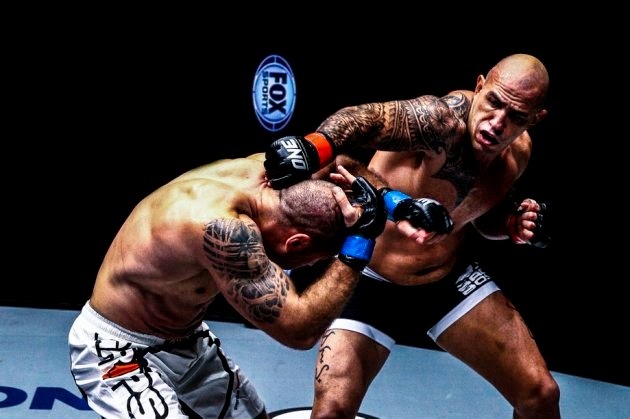 Brandon Vera - From Norfolk, Virginia, Vera joined the UFC in 2005 and racked up four straight wins including a submission victory over Frank Mir. He then lost his next two fights and since then his UFC career has been an up and down affair. Vera joined another organization, the ONE Championship, in 2014 and won his debut under the new promotion against Igor Subora. Eddie Yagin - Fighting out of Honolulu, Hawaii, Yagin fought only twice in the UFC. He lost his debut against Junior Asuncao. In his second outing, he earned a split decision victory over Mark Hominick. After the Hominick bout, Yagin left the UFC and started fighting for other organizations. If you think we missed including a particular Filipino UFC fighter in the list, then please inform us by leaving a comment. Simply mention the name of the fighter and add any information that you deem necessary. We will take care of the rest. We will have to confirm the details about the mixed martial artist and if everything looks fine, we will add him or her to the list.